Ipswich has a long association with swimming, which can be traced back as far as 1329. Sometime in the year 1329-30 John, the son of William Owyth was found drowned in the quay at Ipswich after swimming with some other mariners. 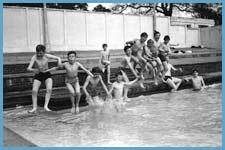 Its heyday was clearly the 1960's when we had an Olympic size outdoor pool at Broomhill, a 33 yard outdoor pool at Pipers Vale and 2 indoor heated pools (St Matthews & Fore Street). 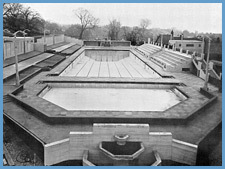 Before the Second World War we could afford to heat both open air pools to 70F, today we are told we cannot afford even to keep one open air pool open. Between the wars there was a continual programme of improvement and replacement. In 1936 the West End Bathing Place had to be closed due to pollution in the River Gipping. In its place the town built Pipers Vale open air baths and this 150 foot pool was opened in 1937. 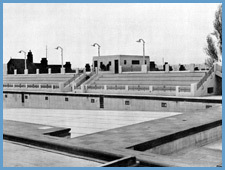 In order to satisfy residents living on the western side of the town a second pool was built a year later at Broomhill at a cost of £17,000 and opened in April 1938. 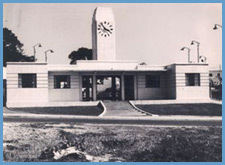 55 yards long and 8 lanes wide, the pool was 5 metres deep at the deep end, accommodated 1, 2, 3, 4	and 5 metre diving boards, a grandstand for 700 spectators, underwater flood lighting and changing facilities for 70 ladies and 108 men. The water was heated and filtered and the 3 hour filtration rate for 2,500,000 litres of water was one of the fastest in the country. The pool had a staff of 29 and was open from 06:00-22:00 from May until the end of August and from 07:00-21:00 in April and September. 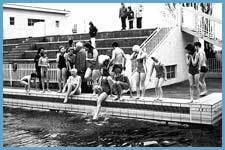 The cost of a swim was 2.5 pence for adults and 1.25 pence for children. The staff were paid £2.62/week. The pool was opened by the mayor and was followed by an inter club competition between Ipswich Swimming Club and Leamington Swimming Club. Find out more: Why save Broomhill Pool?